Maui, the second largest of the Hawaiian Islands, is a dream destination. It's been consistently chosen as the best island in the United States in Conde Nast readers' polls. Maui has some of the most beautiful beaches in the world, is frequented by humpback whales, and has spectacular sunrises and sunsets. There are so many things to do that you'll probably have to make more than one trip to experience them all. We've gathered a roundup of the 20 top things to do on your Maui vacation from hiking to shopping. Nowhere can Hawaii's floral splendor and the wide variety of plant life be better seen than on the island of Maui. Maui is a botanical paradise with its tropical rainforests, cool upcountry slopes, and sunny western shores. Driving down any road, you'll see multi-colored bougainvilleas and hibiscus in almost everyone's garden. Maui is home to a wonderful assortment of botanical gardens, most of which are open for either guided or self-guided tours. On Maui, tropical exotics from all over the world mingle freely with the 24 Polynesian plants that have sustained ancient Hawaiian cultures, such as maia (banana) and coconut (niu), kalo (taro), kukui (candlenut), 'uala (sweet potato), and wauke (paper mulberry). These plants are commonly known as the "canoe plants." At the same time, the steep mountains of Maui contain protected pockets of native plants both endemic and indigenous, many of which are endangered. Close to 1,000 species of these plants occur nowhere else on Earth, and about 100 of these species are indigenous to Hawaii. Since it's an island, it's little surprise that some of the best things to do on Maui take place on or under the ocean. If you're in for some water adventure, go beyond the beach and do some snorkeling, scuba diving, and sailing. Sheltered by Lanai and Molokai, the breezy offshore waters of Maui are ideal for sailing. Try a sailboat charter, speedy catamaran, Hawaiian sailing canoe, or sunset cruise. Family-run picnic excursions cross the channel regularly to Lanai and can get you back in time for sunset at your Maui hotel. Maui has some of the finest dive spots in Hawaii, with dozens of reputable operators. There are two marine conservation areas, one at Honolua Bay on West Maui and the other at Molokini, a partially submerged volcanic crater offshore at Wailea. The contours of the crater turn it into an aquarium without walls. Certification is available in PADI, NAUI, or NASDS. Boats at Kaanapali, Lahaina, and Maalaea offer a number of dive and snorkel excursions. The nearby award-winning Lanai Cathedrals at Lanai is considered to be one of the most beautiful dive sites in the world, and there is also a sunken U.S. submarine to explore. Glass-bottom boats and a pleasure submarine called Atlantis Adventures open up undersea wonders to non-divers. Renting a car is a must for visitors to Maui. While public transportation is better than in the past, it is still sporadic and the routes limited. A rental car allows you to drive around Maui at your own pace. All of the major car rental companies have locations at the Kahului Airport, and it's just a short shuttle ride to their offices from the baggage claim. 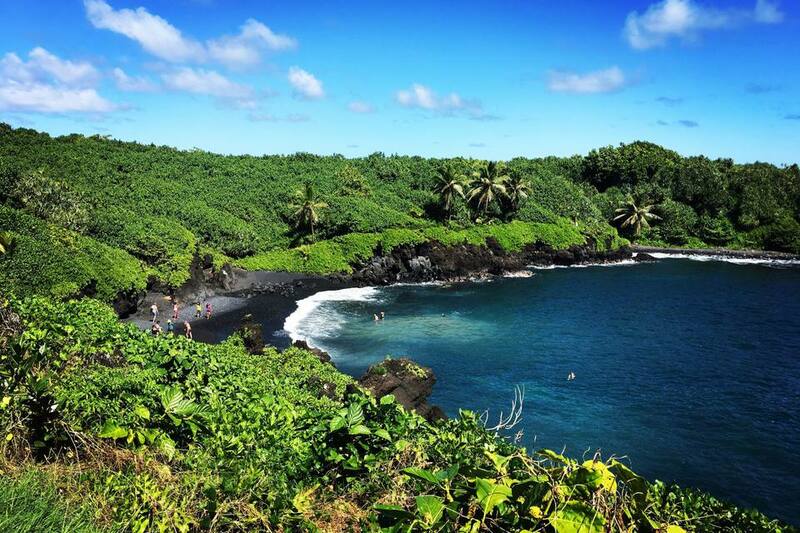 The most popular drive on Maui and in all of Hawaii is the Road to Hana, which has 54 bridges in 56 miles along a winding lava shore, travels through old plantation towns, goes past miles of beaches and through towering forests. Maui is Hawaii's dining epicenter, and it has a restaurant for virtually every taste. Maui has attracted enthusiastic chefs who make national headlines using fresh local produce from upcountry farmers. From lavish hotel dining rooms to lunch counters serving plate lunches, Maui's places to eat are pleasing and diverse. Going out to dinner demands tough choices. Maui's chefs are world-renowned for their culinary creativity. What type of restaurant? Seafood or sushi? Pasta or poi? Chinese or Japanese? Caribbean or Thai? Mexican, Italian, or Vietnamese? The pride of the island, Hawaii regional cuisine, is served at many award-winning restaurants. Where should you eat? South shore or west? Central Maui or Upcountry? There are romantic restaurants and casual family eateries. West and South Maui have restaurants that range from informal seaside fish houses to swank, candle-lit dining rooms with swans gliding by in a lagoon. Oceanfront dining is a Maui signature. In Wailea, innovative cuisine showcasing freshly caught seafood is graciously served by attentive staff in an open-air dining room perfumed by sea air and flowering trees, while somewhere nearby, live violin music accompanies excellent Italian fare in a romantic alfresco oceanfront setting. In Paia, on a cove where an outrigger canoe at sunset evokes thoughts of Gauguin, excellent seafood from the hooks of local fishermen comes in exotic and savory preparations. In central Maui and Kihei, time-honored mom-and-pop restaurants and some of the best ethnic eateries in Hawaii offer top values for family-style dining. If an upscale aloha shirt is the dress norm in Wailea, in Central Maui, it's diner counter casual. Noodle shops, Vietnamese pho, Mexican, Chinese, and American diner fare are among the Central Maui offerings. Maui is a shopper's paradise with its numerous galleries, international shops, designer boutiques, and shopping malls, not to mention its great farmers' markets and swap meets. Many carry Maui specialty items and products unique to Hawaii. These include hand-turned bowls and objects of beautiful native woods; oil paintings and sculptures, hats woven of lau hala; hand painted resort fashions; and one-of-a-kind jewelry, glasswork, and art. In ancient times the summit of Haleakala was only for the kahuna (priests) and their haumana (students); it was where they lived and studied initiation rites and practices. Today, the summit is one of the most popular destinations for visitors to Maui. While the best views into the crater (actually an erosional valley) are actually in the afternoon when the sun is at your back, a trip to Haleakala for sunrise is an experience well worth the effort. If you're staying in West Maui, you'll need to get up by 3 a.m. to make it to the summit for sunrise. The number one thing people think of when they plan a trip to Maui is the beach. There are more than 80 beaches on Maui and 120 miles of coastline. The beaches come in sands of gold, black, green, red, and pure, shimmering white. And while you're at it, grab a snorkel and mask and commune with turtles and many species of fish. The waters of Kapalua, at the north end of Kaanapali Beach (near Black Rock), and in Makena are ideal for snorkeling, especially early in the morning. Many hotels rent snorkel gear, or you can rent it from one of the many dive shops around the island. Try the ancient sport of kings. "Hot-dawg" surfers can test themselves at Slaughterhouse, Hookipa, and Sand Box. Novices can rent boards and sign up for surfing lessons at the hotels, where expert instructors get them up and riding the waves from the first time out. Maui's southern and western coastlines provide abundant opportunities for watching the humpback whales of Hawaii, who are winter visitors. Maui is one of the few places in the world where you can watch whales from the shore. Among the shoreline sites offering vantage points are Puu Olai at Makena; the hotels of Wailea, Kaanapali, and Kapalua; the Papawai Lookout on the road to Lahaina, near Maalaea Harbor; and the waterfront restaurants in Lahaina. Various companies offer whale-watching excursions aboard both power and sailboats. All ocean vessels are required to stay at least 100 yards away from the whales, but as visitors aboard whale-watching cruises will happily tell you, no restrictions keep the whales from coming up to investigate the boats. Three favorite companies for whale watch cruises are the Pacific Whale Foundation, Teralani Sailing, and Trilogy Excursions. As ecotourism or green tourism becomes a more sought-after way to spend vacations, zip lining has become one of the fastest growing eco-friendly activities throughout the world. On Maui, three companies offer zip-line adventures. Founded in 2002, SkylineEco-Adventures was the first zip-line company on Maui and in the United States. Skyline's first zip lines were on Haleakala Ranch in upcountry Maui. More recently, Skyline has opened a second ​zip-line tour in West Maui, called the Kaanapali Skyline Adventure. Kapalua Ziplines boasts that it is Maui's largest dual-line zip-line course outfit. It offers four zip-line tours, lasting from 2.5 to 3.75 hours each. Piiholo Ranch Zipline operates on the 800-acre historic Piiholo Ranch above Makawao on Maui. The ranch tour operations include horseback trail rides and lessons, and Hawaii's longest zip-line eco-adventure. Situated on Piiholo Road near the paniolo (Hawaiian cowboy) town of Makawao, the ranch is at an elevation of 2000 feet on Mount Haleakala with bi-coastal Pacific Ocean views. If you've always wanted to feel what it is like to hang from a parachute but had no desire to jump from a plane or soar off a mountaintop, there's a way that you can experience all the thrill but feel totally safe in doing so. That way is to parasail. On Maui, from mid-May to mid-December, the company that does a superb job of doing this for you is UFO Parasail at Kaanapali Beach. Parasailers are fitted into a comfortable harness and then either alone or in tandem with someone else (the choice is yours), you proceed to a platform at the back of the boat where you are hooked onto the parasail. Before you know it, you slowly lift off the boat for a 10-minute parasail on an 800-foot line. As you are slowly winched off the boat, the parasail carries you high over the waters off Kaanapali Beach. The views of the water and the beachfront are amazing. You might be saying, "What? A museum on an island vacation?" But learning about the history and culture of the place that you are visiting lets you in on a whole new dimension of what you are seeing. On Maui, you can view the living history of Hawaii from the time of its ancient alii (hereditary nobles) and the years of the Hawaiian monarchy to the years when the island was the whaling hub of the Pacific and the leading industry on the island was sugar, not tourism like today. Explore the Lahaina Heritage Museum and the town's numerous historic sites, the island's historic missionary homes, and/or one of its cultural gardens or centers. Like all of the Hawaiian Islands, there is so much that can only be seen from the air, and the views are fantastic. The best way to see all of these places is from a helicopter, and Maui has some of the best helicopter tours in Hawaii. Departing from the heliport at the Kahului Airport, four companies offer flights that include full island tours, tours that concentrate on Haleakala and Hana Coast, and tours that fly over West Maui to the island of Molokai. Choose from Air Maui Helicopters, Maverick Helicopter Tours,​ Blue Hawaiian Helicopters, and Sunshine Helicopters. The island of Maui is just one of the three islands that make up Maui County. The other two islands are Lanai and Molokai. While you can take a flight to either island, the most fun way to see a bit of Lanai is to take a day trip with the Expeditions Maui-Lanai Ferry. The ferry makes five round-trips daily to Lanai from Lahaina Harbor. The trip to Lanai on the high-speed ferry takes just 45-minutes. In winter you're sure to see Humpback Whales in the channel between the islands and you'll almost always see dolphins frolicking in the wake of the boat. After you dock at the Manele Small Boat Harbor, you can easily walk to the nearby beach park at Hulopoe Bay, where you can enjoy the great snorkeling and have lunch at the adjacent Four Seasons Resort Lanai at Manele Bay. If you'd like to explore the island, you can either book a rental vehicle or join a guided tour of the island in a 4-by-4 vehicle. You can arrange a tour directly with Expeditions Ferry or with Adventure Lanai Ecocentre. Lahaina Town was the first capital of Hawaii and was once known as the "whaling capital of the Pacific." Today Lahaina is primarily a tourist stop, but it has an amazing history. Pick up a free copy of its historic walking tour at the courthouse. A day trip to Molokai will take you to Hawaii's most Hawaiian place, where most of the residents are native Hawaiians. You can travel to Molokai by ferry or by air on your own and rent a car, or you can visit the island as part of a day tour. Whatever way you choose, it is sure to be a highlight of your Hawaiian vacation. The Hawaiian Islands are the most isolated islands on Earth, and they offer one of the world's most unique ocean environments. There is no better place to learn about the creatures who live in the waters of Hawaii than at the Maui Ocean Center. The Lahaina Jodo Mission at Puunoa Point, one of the most serene and beautiful places on the island of Maui, is on the outskirts of Lahaina. Many years ago, members of the Lahaina Jodo Mission conceived the idea of building an authentic Buddhist Temple, complemented with the symbolic surroundings that are typical of the great Buddhist temples in Japan. Bordered on the north by the posh Wailea Resort area and on the south by the Ahihi Kinavu Natural Area Reserve, the Makena area of South Maui offers visitors a return to nature and much earlier days of Hawaii. It is the place where the paved road ends, the defiantly wild, rugged and magnificent place where the spirit can run free. Grand, seductive and utterly irresistible, Makena is Maui untamed. No visit to Hawaii would be complete without experiencing an authentic Hawaiian luau. It's an appropriate thing to do on the last night of your stay. On Maui, there is a great selection to choose from. Several hotels stage beachside luaus featuring Hawaiian foods such as kalua pig, cooked in an earthen oven, poi, and haupia (coconut pudding), along with a buffet of more familiar foods. There is lots of Hawaiian music, hula, and even fire dancing. The Old Lahaina Luau is offered nightly at private luau grounds behind the Cannery Mall in Lahaina, West Maui. The Old Lahaina Luau takes great pride in presenting an authentic Hawaiian luau, an evening of traditional Hawaiian cuisine, music, cultural dances, and island crafts. Guests will get a genuine reflection of Hawaii's rich history with a backdrop of an ocean view and sunset. What happens when you combine the Polynesian cuisine of Chef James McDonald (of Pacifico and Io Restaurant fame), the entertainment expertise of the folks who run the Old Lahaina Luau, and one of the best beachfront settings in Hawaii? The answer is the Feast at Lele in Lahaina. The Feast at Lele is more like a fine dinner show than a traditional luau. Each table has a tablecloth, china with silverware, and cloth napkins, and guests get personal attention from at least two servers. The feast itself is the real star here. The menu consists of a five-course meal featuring cuisine from Hawaii, Tonga, Tahiti, and Samoa, plus dessert. Each course is followed by dramatic Polynesian entertainment from each island. At the Wailele Polynesian Luau at the Westin Maui Resort & Spa's Aloha Pavilion, the chefs create a four-course dinner that is presented family-style, just like in the old days. Crafters with interactive arts and culture allow guests to participate and learn about the Polynesian way of life, and the show boasts the most extreme troupe of fire knife dancers on Maui.